The ITAL-A is rugged, compact and manufactured with the latest cutting-edge technology. The A-series includes an adjustable focus infrared laser which allows the operator to adjust the size of the laser beam depending on mission requirements. When focused, the laser provides a continuous beam along the weapon's line of fire for precise aiming. When defocused, the beam spreads to provide improved illumination and situational awareness. Visible models are available with either a red Super Power Point laser pointer or a green Ultra Power Point laser pointer designed to improve range and visibility in daylight and at night. It offers faster target acquisition and is FIVE times more visible than traditional red lasers. The high power green laser is perfect for operations using SCBA and other DBRN equipment, and the waterproof metal housing allows for complete decontamination. The OTAL Classic Infrared Pointer (835nm) (<1mW) Designed with the same cutting-edge technology as our high powered military devices, these models are powered with a Class I infrared laser for use with night vision equipment and for CQB operations and training exercises. OTAL's mount behind the front sight on M-16 or M-4 style rifles and the laser is offset to project around the front sight. Classic models can be equipped with either a visible Super Power Point laser or an infrared laser for use with night vision devices. 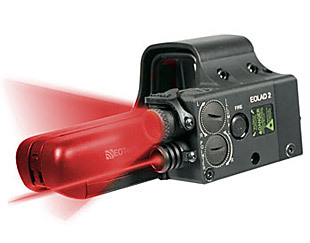 The EOLAD-2VI Visible Red Pointer (635nm) (<5mW) and Infrared Pointer (835nm) (<5mW) - The EOLAD-2L combines the speed of the L-3 EOTech 552 optic with the power and precision of a Laser Devices laser. This single, compact device provides lightening fast target acquisition with pin-point accuracy and eliminates added weight to the front of the firearm. This item is available for sale to Military and Law Enforcement Agencies only. Documentation required may include a Purchase Order on department/institution letterhead and additional certification forms. Certain federal, state, and/or local laws and regulations may apply. 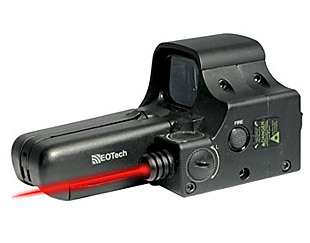 The EOLAD 1V Visible Red Pointer (635nm) (<5mW) The EOLAD-1V combines the speed of the L-3 EOTech 552 optic with the power and precision of a Laser Devices laser. This single, compact device provides lightening fast target acquisition with pin-point accuracy and eliminates added weight to the front of the firearm.